For many who attended, Malaga was a very mixed experience. I am sure the post-mortems will happen, so I will not dwell on the organisational problems here. The sport was great, of course, and I took a great many photos. Unfortunately, I had more time to work as a trackside photographer than I had intended. Only a week prior to leaving to Malaga, where I had planned to fit my photography around my sprinting commitments, injury robbed me of the opportunity to compete. The story is here, in my blog. So, "my Malaga" became a long round of up to 12 hours a day in 30 degree heat, trying to get a representative selection of the British and Irish athletes I had intended to photograph. This involved attempting to capture a championships that had been spread out around four different venues, plus another one for the cross-country races (which I did not attend), and yet another one, (which I also never got to) for the medal ceremonies. What I did do was get to know the 40 minute walk through the city centre from my hotel to the Malaga metro system, and those train journeys, very well indeed. And back again each evening, of course. I'll probably blog something about the life of a photographer at these Championships. It won't be for the faint-hearted! I have organised my photos in the simplest way I could think of: one gallery for each day of the event. Follow the link against each day, below. The opening day of action. I had numerous chores to do connected with registering and ensuring I had access as a photographer to all venues. 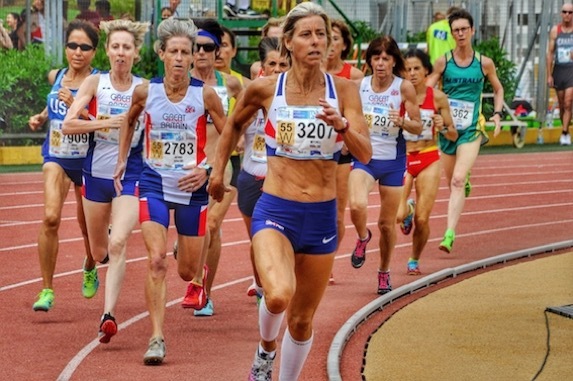 For what was left of the morning, I photographed a little of the M35 age group decathlon at the Malaga main stadium, before scurrying off on the Metro to the stadium at Carranque, where some of the older athletes had shot put and hammer events taking place. I also squeezed in just a few photos of the M40 decathletes. A busy day for me again. I spent the morning photographing the sprinters in the 100 metres heats at the main Malaga stadium. This should have been the day I began my own participation in the event, but injury forced me to be a bystander. I had been confident of making the 100 metres semi-finals, and still feel I probably would have done, un-injured. I was at the Universidade stadium all afternoon to photograph decathletes, heptathletes and shot putters. I decided not to photograph the morning's 100 metres semifinals as well as the finals in the evening, having, of course, already photographed many of the heats the previous day. Even I can have an overload of sprint races. The finals gave a long and exciting evening in the Malaga stadium, with plenty of Great Britain athletes doing well. A down-side was the stadium officials constantly deciding they didn't like where we photographers were standing, and moving us about. You'd think they had better things to do! A day full of hurdles. Literally. I was at the Carranque stadium in the morning, to photograph some of the track hurdles races, then took part of the afternoon off to rest my feet, before travelling to the main Malaga stadium to catch the last four or five 3,000 metres steeplechase races being held there. There had been so many races, the stadium had been running nothing but steeplechase finals all day long. I like photographing this event; it seldom fails to deliver some good images. I think some of those I shot will prove to be my favourites from the Malaga championships. Enjoy. This was a day off from competition, so I had a rest from the camera. One of the most enjoyable days photographing sport I have had for a very long time. 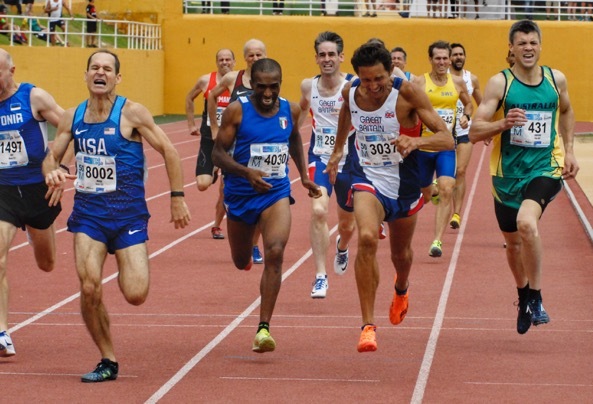 Sunday was the day of the semi-finals and finals of all of the 200 metres races, at the Universidade stadium. It rained just occasionally, but respite from the heat and humidity of recent days was very welcome. My photos are set out in the order the day happened. The first races in the gallery are selected shots from the semi-finals. These are followed by my choice of photos of the finals. A very diverse and exhausting day, with a pretty early start to catch a few views of the 10k race-walkers, then over to Carranque stadium to shoot some high jump, weight throw and eventually a whole load of 800 metres semi-finals, until it was nearly dark, and time to return to my hotel. This day was hot, too. There is long jump, pole vault and weight throw, and even a couple of decathletes in my photos for this day, at the Carranque stadium, but mainly it was a morning to evening celebration of 800 metres racing. Watch out in particular for the very close finishes in the M55, M50 and M40 races. The medals for these were decided by very small fractions of a second. I was at the Universidade stadium for another 12 hour day. There were some 5,000 metres races in the morning, plus a javelin contest and some pole vaulting on the programme, but the last five hours of the day was for the 400 metres semi-finals. I was dogged by camera problems all day long, so this gallery is slightly smaller than I'd intended. 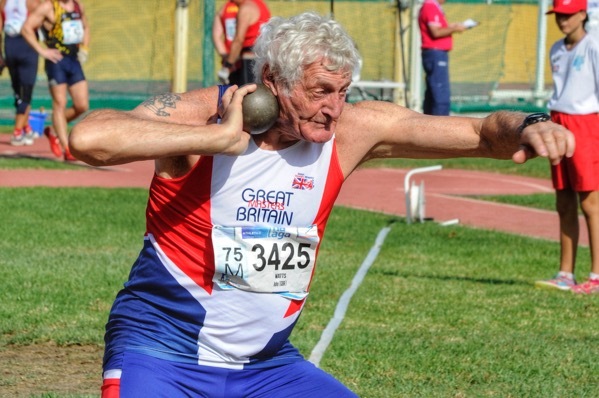 There were just two age group's throws pentathlons on the programme this day, and I decided to take a day off. Therefore, I have no photos to show you. A big day, in two parts. The morning was all 400 metres finals, held at the Universidade stadium, after which I had to rush over to the Carranque stadium and record the best action from an afternoon and evening of heats of the sprint hurdles races. This was not good preparation for the mammoth session facing me next day! Hurdles finals day. It was a long, drawn-out experience for me, because the morning (a couple of semi-finals I didn't shoot, plus the 80 metres races, which I did) was separated by a five hour gap when basically nothing happened on the track. The evening session of 100m and 110m hurdles final was short and very sharp. This is a smaller gallery of photos than most of the others, thanks to the stadium officials again constantly changing their minds about where I could stand as a photographer. I invariably ended up being told the only place was the one I had started out in. And I didn't take any photos of the Closing Ceremony, either. It provided the only break I had all day from working in the heat and the sun! You can find details of how to buy photos from me by clicking here.